Brazil is the sixth biggest economy in the world, and it’s expected to climb even higher this century so I daresay we’ll continue to see more bands like Kattah from South America’s largest country make inroads into the international metal scene. 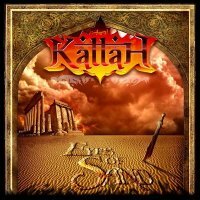 Kattah are an interesting proposition; in essence they’re a power metal band at heart. However, what makes their sound more unique is that they employ a strong Arabic influence too, and the band is up to the task of stretching their metal sound out into prog territory with some lengthy musical passages. The band is led by singer Roni Sauaf, originally hailing from Lebanon, who has a hand in writing all the material. It’s curious because it’s his voice that can at times be the weak link. He can sing and is generally ok but he can overdo it at times. On the title track he yelps like Bruce Dickinson might if he were singing while strapped to an electric chair. He renders a lot of the lyrics unintelligible, but the nicely packaged CD includes the lyrics if you want to know what he’s emoting. Loosely, it’s about a person called Kattah who is looking to find the meaning of life, trying to separate reality from illusion. The record works best when they play their trump card which is when they bring in their Arabic influences, often during the instrumental sections of the songs which add a flavour to their music that’s as appetising as seasoned lamb kofta. Additional keyboards are often brought in to create mood without competing upfront with the big, heavy bass and guitar sound. The guitarists Victor Brochard and Pablo Parra equip themselves well, adding thick powerful riffs and some fine solos as on ‘Groupies’ and ‘Illusions Of Dreams’. Parra has a couple of co-writes with Sauaf and these songs have a more melodic element, such as ‘Deep Feelings’, a song you could imagine a melodic rock band tackling if they lightened the guitar tone and used a different singer. Another song that surprises is ‘I Believe’, a power metal song in nature, which has a more modern commercial chorus that wouldn’t be out of place on an Emo record. However, it’s the songs that the whole band are involved in writing; ‘Eyes Of Sand’ and ‘Lebanese Aura’ where all their influences combine to create some stirring Middle Eastern metal. This is what will set them apart from the other power metal bands and it’s this direction they’ll need to continue to pursue if they’re to make an impact.